Bill Blackbeard's collaborator on his first story for Weird Tales was another young writer, James Causey. James Oliver Causey, Jr., was born on July 12, 1924, in Compton, California, and grew up in Long Beach. The first writing credit I can find for him is his first story for Weird Tales, "The Statue," from the January 1943 issue. Half a year later, "Legacy in Crystal" appeared. Finally, in its November 1943 issue, Weird Tales printed Causey and Blackbeard's "Hammer of Cain." Causey was apparently by then serving in the military, having enlisted in March 1943 in Los Angeles. Like millions of men from his generation, his life was interrupted by World War II. Causey's writing career picked up again after the war. At least four of his stories were published in Street and Smith's Detective Story Magazine between June 1945 and March 1947. In the early fifties, Causey tried his hand at science fiction with stories in Galaxy Science Fiction, Science Stories, and Orbit Science Fiction. One of those stories, "Felony," was selected for inclusion in The Best Science Fiction Stories and Novels: 1955, edited by T.E. Ditky (1955). Causey returned to crime fiction in the late fifties with three well regarded novels, The Baby Doll Murders (1957), Killer Take All (1957), and Frenzy (1960). One of his stories was also adapted to an episode of Alfred Hitchcock Presents. Called "Deathmate," the episode was written by Bill S. Ballinger and aired on April 18, 1961. Frenzy, by the way was not the same story as in Hitchcock's film, Frenzy (1972). James Causey died on April 13, 2003, in Laguna Beach, where he had lived for many years. His daughter-in-law, Karen Causey, called him "[a] man of great wealth with regards to writing and in conversation," adding, "He is greatly missed!" You can read her comments and more on the blog, Mystery File, here. Causey's three stories for Galaxy Science Fiction, "Teething Ring," "Felony," and "Competition," are apparently in the public domain and available free on the Internet. "Teething Ring" also appeared in 50 Short Science Fiction Tales, edited by Isaac Asimov and Groff Conklin (Collier Books, 1963). 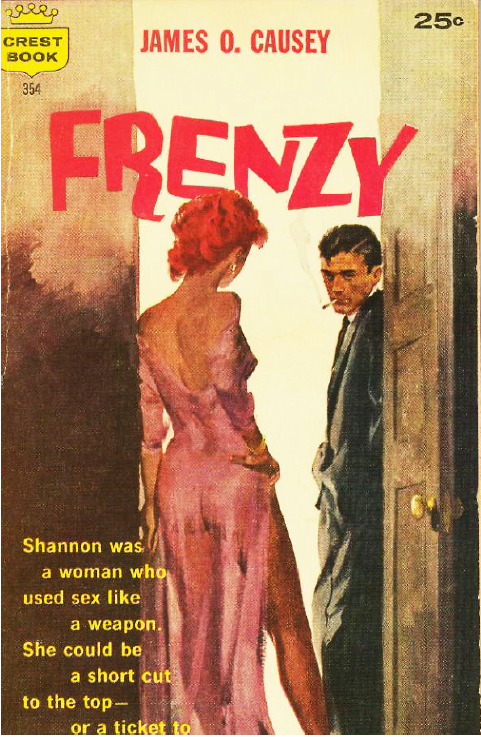 Lacking an image from Weird Tales, I offer the cover of one of James O. Causey's novels, Frenzy (1960). Thanks to Randal Everts for James Causey's places of birth and death. Who Was Allison V. Harding? Why Tellers of Weird Tales?